Ran Mouri and Shinichi Kudo are childhood friends and each other's canonical love interest. They have been friends and playmates since kindergarten. 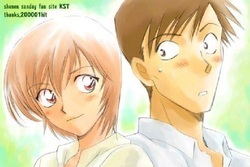 Their friendship has received some censure from Ran’s mother, Eri Kisaki, when Shinichi would convince Ran to do things that could be considered dangerous, such as walking to and from their elementary school after dark. They are very close to each other: even as students in their second year of high school, they address each other by first names without any honorific. Ran is occasionally annoyed by Shinichi's obsession with Holmes, and Shinichi is a bit disturbed by Ran's ability to crack concrete when she's unhappy, but they generally get along well. Prior to the storyline beginning, both seem to have been clueless about each other's feelings. However, when Ran first meets Conan (whom she's unaware is really Shinichi), she confesses that despite his flaws, she really likes Shinichi—which causes him to blush and nearly confess his real identity despite his resolution to hide it. Conan currently lives with Ran and her father, Kogoro Mouri, who is a private detective. Ran treats Conan like a little brother, including often holding his hand or hugging him, once sleeping in the same bed, and once even dragging him into a hot spring bath together (the mere memory of it gives Conan a noseleed and a healthy fear of Ran ever discovering his true identity). Conan is very protective of Ran and jealous of her receiving any attention from other guys, going so far as to admit to Eisuke Hondou that he is Shinichi in order to forbid Eisuke from asking Ran out (and eventually to go to America with him). Non-canonically, Shinichi has confessed to Ran in the 4th movie 'Captured In Her Eyes', which she mistook as his attempt to get her memory back due to him unknowingly using the same words Kogoro used to propose to Eri. Canonically, Shinichi nearly confessed to her during the Desperate Revival arc, where it was implied that if he hadn't been interrupted by a murder case and then reverting to Conan, he would have proposed. Additionally, during the visit to London, Shinichi finally revealed his feelings to Ran; while she didn't explicitly respond in kind, Shinichi figured out her feelings by the way she prompted his own confession. Heiji and Kazuha grew up together and are easily each other's best friend. Neither of them have been shown to have other close friendships, though Heiji does have a rivalry with fellow kendo practitioner Okita. They often spend time together, and Kazuha typically comes along when Heiji visits the Mouris or vice versa, getting caught up with Heiji in the criminal investigation. Kazuha and Heiji both wear good-luck charms that Kazuha made with pieces of the handcuff chain that stuck them together temporarily as children. 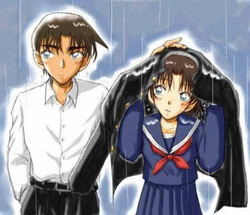 Kazuha and Heiji have both shown jealousy when the other appears interested in someone else, but they are not officially in a romantic relationship. Kazuha has demonstrated awareness of her affection for Heiji, but has been either too shy or otherwise interrupted any time she tries to tell him. Heiji, in contrast, is either emotionally oblivious or purposefully ignoring his feelings for Kazuha for most of the series. Heiji has yet to attempt any sort of confession to Kazuha, but he is very protective of her. Whenever Kaito has to transform into "Kid" he usually knocks out Aoko so she doesn't know that he's "Kid", and so that she doesn't get in harms way during one of his heists if they are together. One of the fan speculations of why Kaito hasn't confessed his feelings for Aoko yet is because he's still "Kid" and he doesn't want to put her in harms way of the orginization that killed his father if they ever caught wind that she's important to him, similar to Shinichi's Problem when it comes to Ran. Kaito has almost kissed Aoko before in the Magic Kaito Chapter, "The Phantom Theif Lady Part 2" when he escaped a simular situation that had made his mother and father start dating when his mother was still a thief, but since she was sleeping at the time and he thought that it was his fault that she got involved in the situation he said he "Would hold off for now" meaning that he does wish to kiss her but not when he's still "Kid." It is shown in several manga chapters and anime episodes that Haibara gives hints about liking Conan. However, whenever Conan asks her about it, she always claims to be joking. Fans think she is trying to hide her pain on the fact that he loves Ran. Conan watches out for Haibara's safety and tries to protect and save Haibara if anything happens to her. He also worries about her mental condition when the Black Organization is involved. Yukiko Kudo and Jodie Starling sense that Haibara might have strong romantic feelings for Conan. Haibara is usually the first to notice Conan's actions and she knows well what he is up to. Mitsuhiko develops heavy romantic feelings for Ai, and Ai is aware of this. However, although Ai is kind to him, she does not seem to reciprocate romantic feelings for Mitsuhiko, perhaps because she is really much older and has had very different life experiences. Ai uses his feelings to her advantage when she needs him to do something, but she also admires his courage during critical situations and respects his feelings. She, in some episodes, also shows more confidence with Mitsuhiko than with Ayumi or Genta. 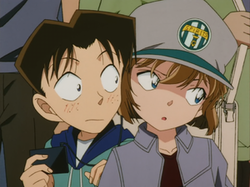 A recurring element in Mitsuhiko and Ai's relationship is Conan; he usually secretly observes their "moments" and pokes fun at Ai's interest in Mitsuhiko while she replies with some sarcastic comments. Wataru Takagi and Miwako Sato are two officers working under Inspector Megure in the first division of the Tokyo Metropolitan Police Department, where Sato is currently Takagi's superior. As the story progresses, they start developing strong mutual romantic feelings for one another. Despite being heavily admired by many male colleagues around her, especially Inspector Shiratori in the beginning, Sato still cares and worries about Takagi deeply, most notably during situations where his safety was put at risk. She also finds in Takagi traits that remind her of her late colleague and lover, Jinpei Matsuda. Takagi, on the other hand, respects Sato as his senior and loves her sincerely as a girlfriend, even to the point of willingly sacrificing his own life just to keep her away from all dangers. After going through numerous difficulties and challenges, in some later cases, their relationship was subtly hinted to have developed to a sexual period; however, the true nature of this development has yet to be confirmed. A running joke in the series is that their relationship never progresses because of interruptions by the rest of the police force or other characters.